Being a stay home mum, my list of chores goes on and on and one of it which has become cyclical, unexciting yet absolutely necessary is... doing the laundry. Yup, with three young kids in the house, laundry is a never ending story and it always seems like there are mountains of dirty clothes waiting for me. I don't really get it but our laundry baskets, not one but two in fact, fill up faster than I can catch my breath. That sense of satisfaction that comes from seeing empty baskets is short-lived but the good thing is it happens every alternate day. 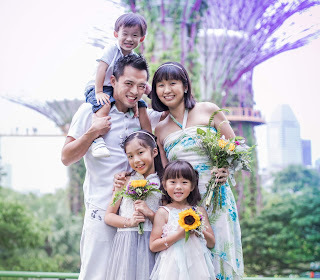 That's right, with a family of five, I have to diligently do the laundry once every two days to ensure that they don't pile too high and that we constantly have clean clothes to wear. Moving to the new house meant that it was time to upgrade our washer and I wanted one that was bigger, better and stronger. 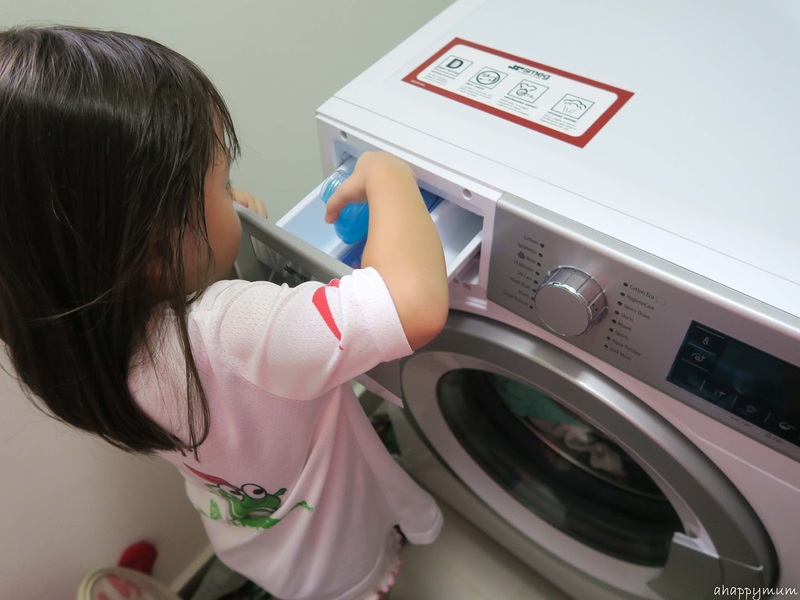 Since this would be a frequently used appliance and we're talking about cleanliness and personal hygiene for the little ones (Did you know? Dirty clothes can harbour microorganisms which can lead to skin infections. ), I was looking out for a brand that spoke of high quality and a brand that I could trust. 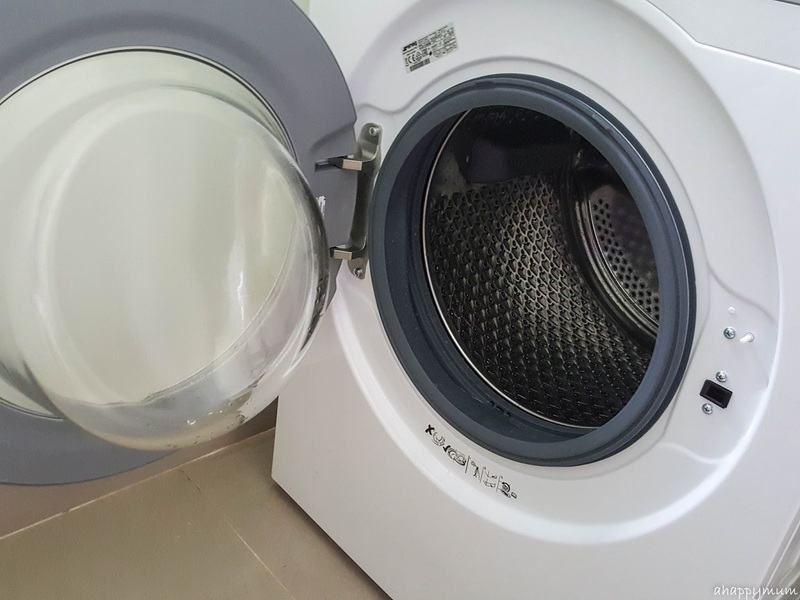 In today's A Happy Home post, I'll be sharing our review of the Smeg WHT1114LSIN 11kg Front Load Washer. On the downside, front load washers are more costly, they don't usually let you add clothes in the middle of a wash and the cycle time is also longer. So yes, it ultimately depends on your needs and preferences. I'm a convert from top load to front load and I highly doubt I am ever going to look back again because our Smeg front load washer is currently doing a very good job at home. Let me tell you more about it. 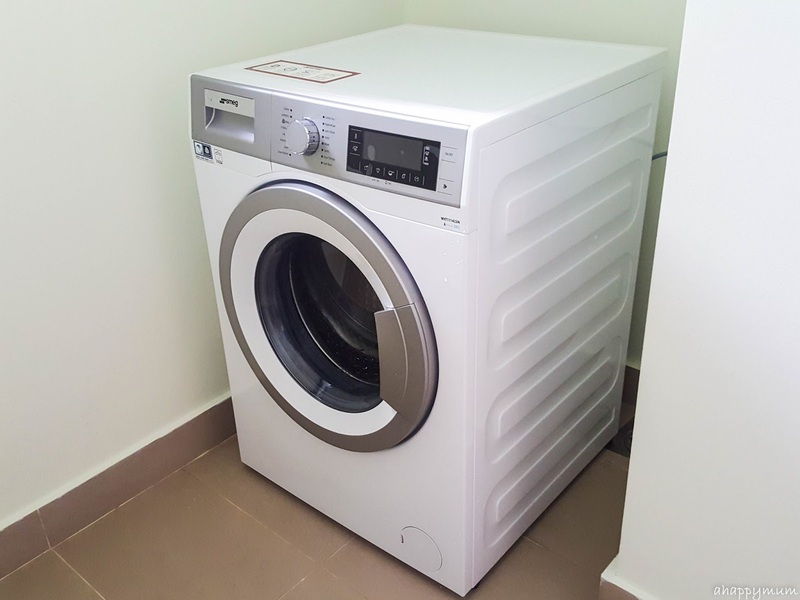 Measuring 60cm (width) by 84cm (height) by 63.5cm (depth), this powerful yet compact washer tucks into our kitchen yard neatly, leaving space at both sides which makes the area look less cramped. 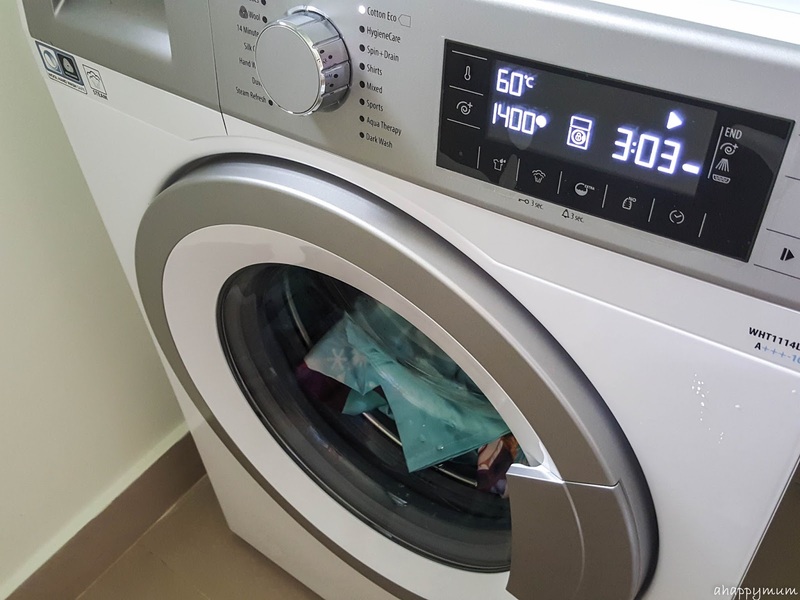 I was very impressed by the sleek design when I first saw it - white body with silver trim, stainless steel basket, program selection knob, LCD display. While being aesthetically pleasing is a plus point, what I really care about when getting a washer is its functionality and how well it serves our laundry needs. Having used the Smeg washer for over a month, I can safely say that this has been a huge improvement from our previous one and I'm loving it for the below reasons. 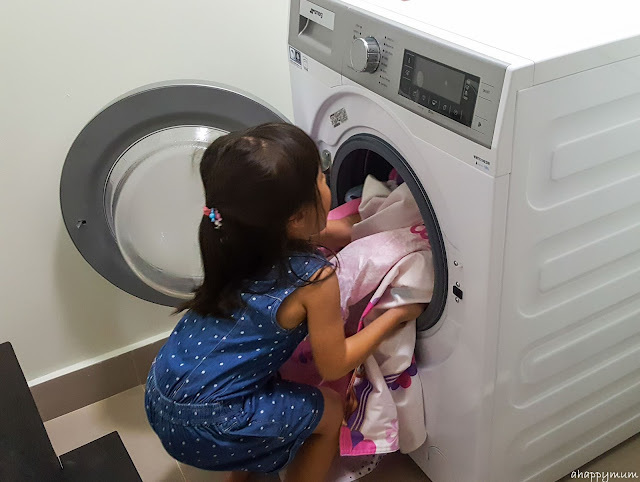 Our previous washer had a 9kg capacity and on some days, for instance when we do the bedlinen, it would take us two rounds of washing just to get everything clean. 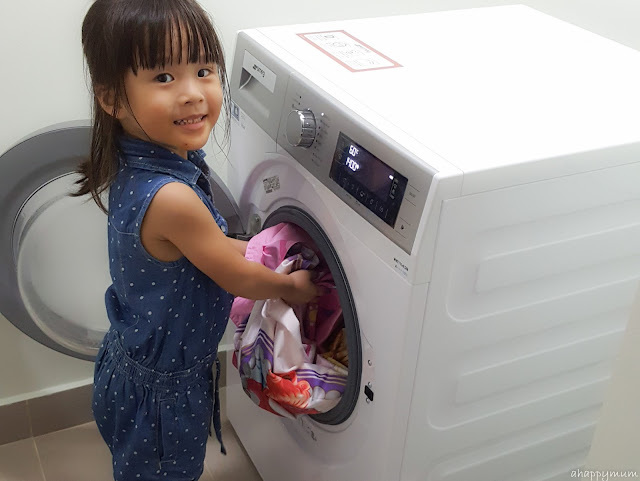 As the number of kids increases, especially with an active toddler who can somehow soil 4 to 5 sets of clothes a day, the Smeg washer is a powerhouse that suits our family needs perfectly with its 11kg capacity. Yes, now we can wash everything at one go! Oh, and here's another advantage of a front load washer - the kids can help you to load the clothes into it too! It's all about training them from young, don't you think so? Mixed - used to wash cotton and synthetic clothes together without having to sort them. I use this often because I just don't have the time to sort and wash the laundry according to fabric type. HygieneCare - for washing baby laundry or laundry of allergic persons, includes longer heating time and additional rinsing step for better hygiene. This comes in handy for newborns and babies. Aqua Therapy - washes sportswear or outdoor garments with chemical finishing through a special washing movement. This is what we use to wash waterproof clothes and swimsuits so as to protect the finishing. 14 minutes - for washing lightly soiled and unstained cotton laundry in a short time. On days where the dirty clothes don't seem so dirty or when we have to rush out, this quick program suits our needs. Sports - used to wash garments worn for a short time such as sportswear. 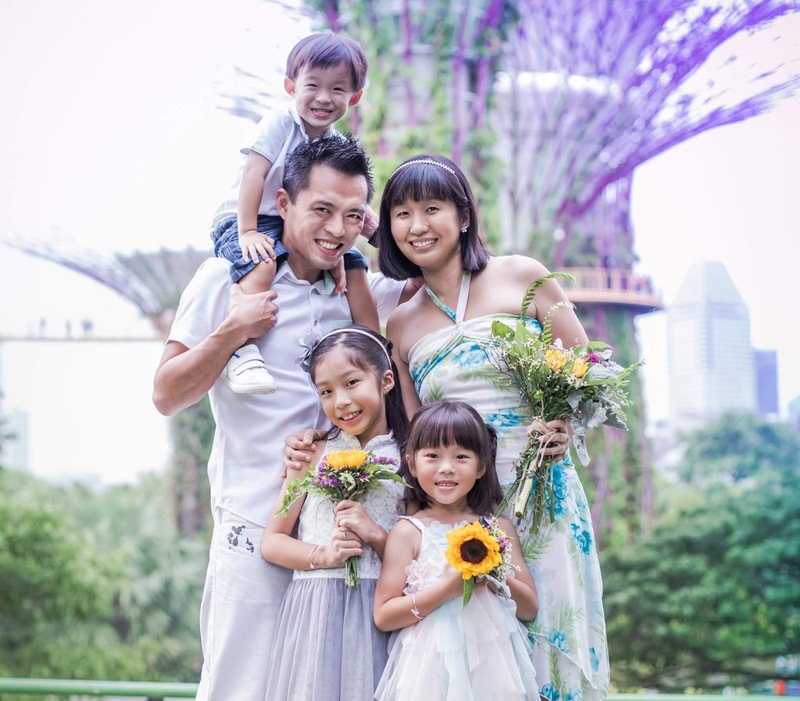 This is handy for the hubby who participates in badminton tournaments and goes for football sessions. Handwash - used for laundry that says "not suitable for machine washing" through special washing movement to minimise shrinkage. This means I literally don't need to handwash any laundry nowadays, yippee! Other than the above, you can also wash Duvets, use a Steam Refresh to pre-treat the laundry and soften the soiling, or select Wool, Cottons, Cottons Eco, Synthetics or Silk Care to suit the type of fabric. The other programs are namely Shirts, Spin+Drain and Dark Wash. 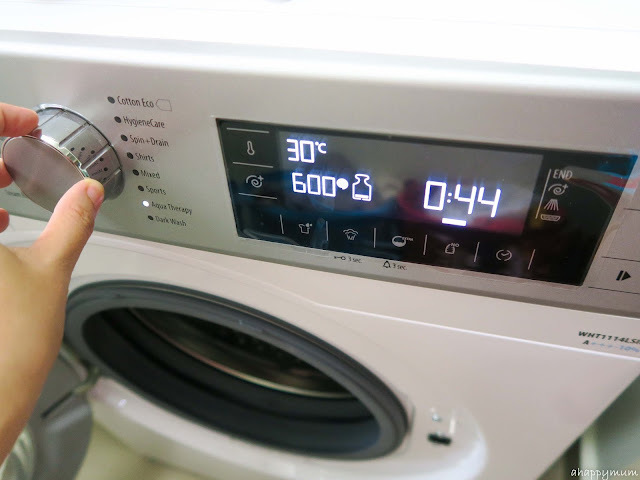 While the programs provide a recommended temperate and spin speed, you can also adjust them to suit your preference before every wash. If you think having 16 wash programs is impressive enough, wait till you hear this. The Smeg 11kg front load washer offers auxiliary functions, including Prewash, Rinse Plus, Anti-Creasing and Steam. 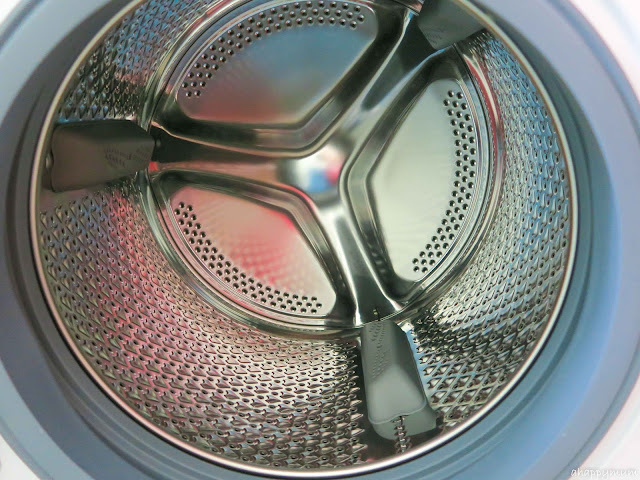 Prewash helps with heavily soiled laundry, Rinse Plus lets you make another rinsing and reduce detergent remnants (for babies, allergic skin etc), Anti-Creasing uses a reduced drum movement and limited spin speed to minimise creasing, and Steam helps to soften the soiling by giving steam. Although you can only choose auxiliary functions which are compatible with your choice of program, I like the fact that it allows you to be flexible and customise your wash according to your needs. I must tell you, our previous top load washer could get really noisy to the extent that we were able to hear it all the way from the living room and our bedrooms. Yup, it's as bad as that. In fact, the machine even vibrated so hard and so violently that it would always move out of its place. For the Smeg 11kg front load washer, there are two volumes to choose from (not that I will choose the louder one) and the sound is kept to a minimal and doesn't wake sleeping babies. Phew. It is also so sturdy and heavy that you can't lift it up on your own and it will also not shift out of its position. In addition, another plus point about front load washer is that it tends to produce very little of lint and you don't have to keep clearing it. 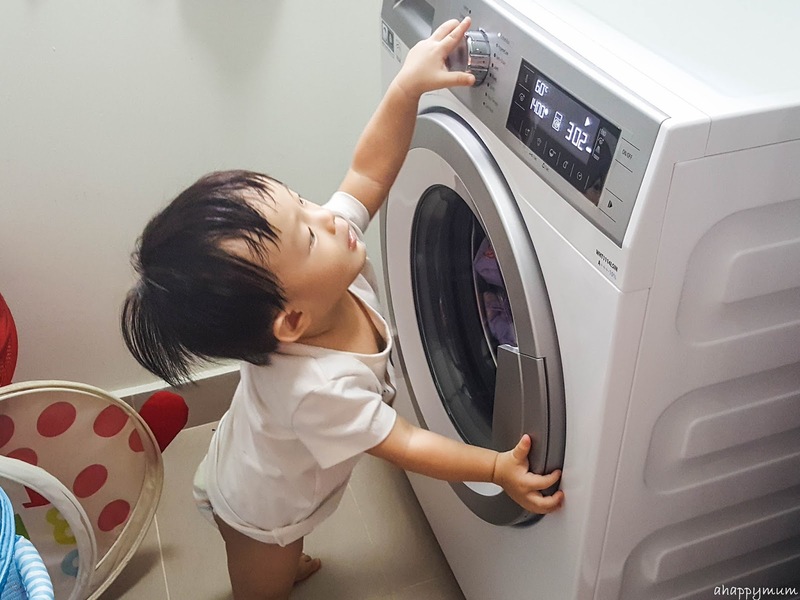 Judging from how the toddler, who is just starting to walk, can gain easy access to the yard and stand up to reach the buttons, it is a relief to know that there is a Child Lock function to prevent him from meddling with the washer and making changes to the cycle or bringing it to a halt. Also, once a program starts running, the loading door is locked and can only be opened after the program ends. Although this means you can't add any clothes once a cycle starts, it also ensures the safety of your child who attempts to open the loading door when you're not looking. 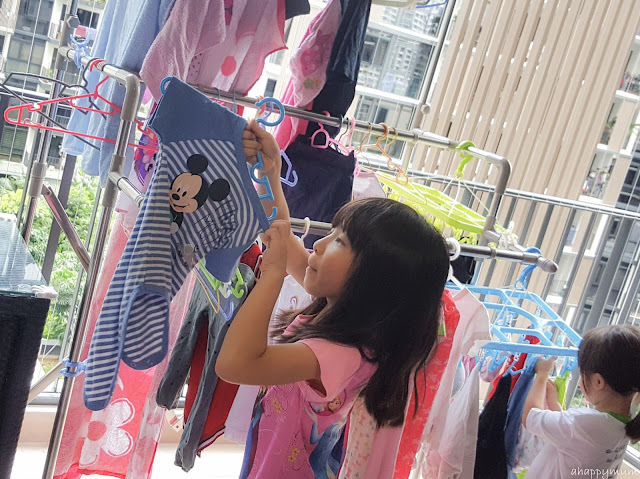 I've been roping the kids in to help with the laundry since we shifted to the new house and what comforts me is that so far, they have been awesome helpers and are willing to take on the responsibility of doing the household chores. It might be a little unbelievable that I chose not to have a dryer in the house but it also means the kids and I get to hang the laundry together every now and then - which has become a fun bonding time for all of us. With these lovelies around and the presence of our trusty Smeg washer, I think I really don't mind, and might even start to look forward to, this never ending chore. Disclosure: This is sponsored collaboration between Smeg and A Happy Mum. We received the Smeg WHT1114LSIN Front Load Washer for review purposes. All opinions are my own.